Napoli defender Kalidou Koulibaly sprinted half the length of the pitch for his team on Monday to win the ball after he was beaten on the half-way line. The 27-year-old is currently the subject of interest from Manchester United in the Premier League, who have identified him as their main January transfer target, according to Goal. Goal states that United boss Jose Mourinho refused to comment on reports that the club has offered €103 million for Koulibaly, but after watching this latest clip, that mooted fee looks like a bargain. 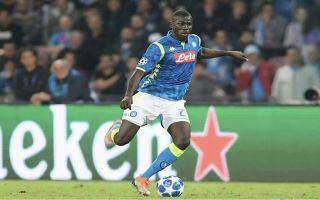 During Napoli’s 2-1 away win against Atlanta earlier this evening, the Senegalese centre-back was seemingly left for dead way up the pitch by an opposition attacker, who then drove forwards before being brilliantly pegged back just before entering the penalty area. Koulibaly’s recovery run was nothing short of amazing, as in the end, he nabs the ball away before any danger could materialise and then restarts another Napoli attack with a composed pass. Check out the brilliant moment below via Twitter, which is sure to whet the appetite of Man United fans across England!